Unless you are suffering from engine knock (detonation) water injection is not going to do much for a lower end boost. The reason for water injection is to allow pump gas on some high highly boosted systems. I had engine knock issues running 16 psi on the Grand National with 93 octane. I could add octane booster and it would go away but that was just a band-aid for the problem. The fix was a water-meth injection that would start at 8 psi. Lol. Ok... know I want to know more about water meth injection please. Water injection on highly boosted engines did 2 things. It helped cool the air charge and it retarded detonation. The problem with a supercharger is that it takes HP to create HP to the tune of 25 to 40% drain of the power created depending on the SC design. The water injection is a band aid to get around a tuning roadblock to bump the compression. Find a speed shop that specializes in boosted engines. I'm gathering info for my V8 swap. I want more than just a V8. I also like many others want it to appear factory installed. I also want to run 33inch tires. It's a 4x4 V6 SOHC auto currently. I love the sound of superchargers. I considered adding the moddbox kit to the V6 but I think the V8 swap gives me a lot more options. I want it to be realy quick from a dig and fast enough to still accelerate from freeway speeds. I'm not trying to go street outlaw but I want it to be fun like my old mopars were. They were geared 3:91 and 4:10. They would pin you to the seat till I let off the gas. I also want it to run pump gas. I thinking 4:56 or 4:88 gearing will work for the 33 inch tires? Will I be able to accomplish this with a m90 0r m112 Eaton s/c on a properly upgraded Windsor and not need to tear the engine down frequently? Forged pistons of course. I was hoping there was a kit because mustang's have been modding 5.0L for years. Also what other considerations should be addressed? Ahhh. Yeah necroed. Lol. I thought the last post was Nov 2018. My bad. I'll start a new post if need be. 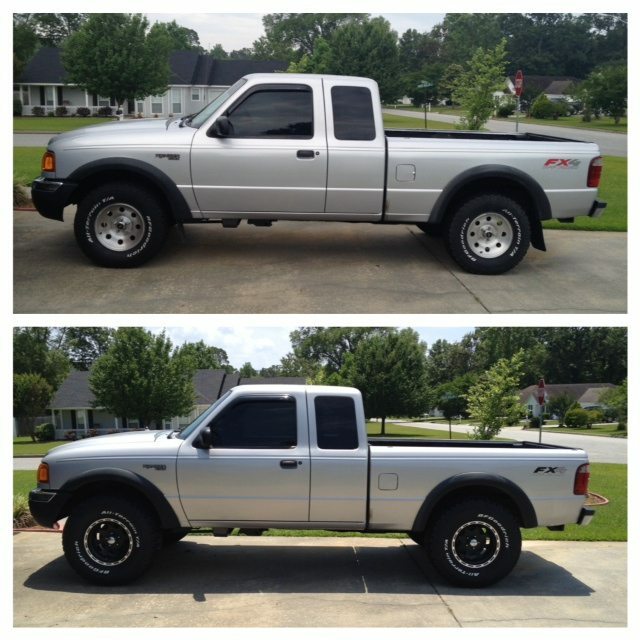 On my last 2 Rangers before my current one, they came stock with 4.10s and 31x10.50s. I ran 33x12.50s on both of them. As with any increase in tires size, you could notice it. But I could light them up if I wanted to. On the last one (2002 FX4), I added an SCT tuner to correct the speedo and even give it a little more power. To me, it was perfect for light offroading and still not getting me into single digit fuel mileage. Al so on the FX4s, no rubbing with some nice 3 5/8" backspaced wheels. My current ranger has 3.73s and I went with a 275/65R16. I cant run 15s due to the larger brakes, or I would have went 32x11.50s. I was contemplating 4.10s though. I also threw an SCT tuner on it, I got tunes from 5StarTuning.com. It corrects my speedo/odometer and gives me options to tune for towing, power or eco. 4.56 will be better if you still tow or do some decent off-roading, IMO 4.88s will be overkill unless you do a lot of hill climbing. Don't get me wrong, it'll be awesome off road but your fuel mileage will be horrible on and off road. Here's the last '02 FX4 with 33x12.50s. Just a t-bar crank. 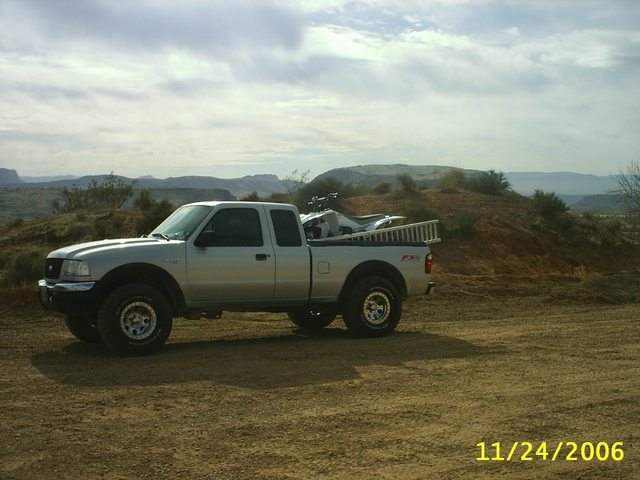 And heres the first '02 FX4 I had. This thing did great off road with 4.10s and 33x12.50s, again just a t-bar crank. Page processed in 0.1771 seconds (17% database + 83% PHP). 60 queries executed.